In Edinburgh, the home of free gardening was the Free Gardeners' Institute in Picardy Place, the headquarters of the Edinburgh District of the British Order. The older, Scottish-based Ancient order of Free Gardeners leased offices in Oddfellows Hall in Forrest Road and used the facilities there. In most towns and villages round about the gardeners had a favoured meeting place. 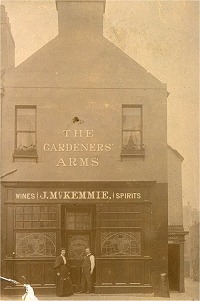 In Haddington it was the Gardeners Arms public house, which the fraternity had owned for most of the 19th century. These venues hosted social events as well as business meetings, everything from dances and concerts to lectures and magic lantern shows. Some lodges kept a reading room or small library for the use of members. 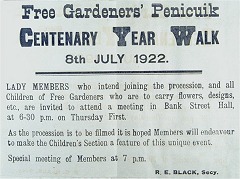 Free gardeners often secured for themselves a privileged role in public ceremonies. Just as Masonic lodges turned out when a foundation stone was laid, gardeners paraded when commemorative trees were planted. Many lodges kept their profile in the public eye by an annual celebration. In Penicuik the lodge paraded through the streets accompanied by 'Old Adam' and a number of 'Virgins'. Members produced extravagant 'buskits o' floo'ers', for which the best was awarded a cash prize. Although women could not join the lodge, the annual walk was a family event, open to all. In Musselburgh the lodge participated in the Riding of the Marches held every 21 years. In 1916 Dunfermline free gardeners celebrated their bicentenary by marching the boundaries of their own property, the land that provided the society with its main source of income. Anniversaries were a general cause for celebration. 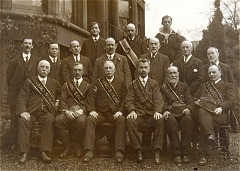 Penicuik celebrated a full programme of events in October 1922 when the lodge passed its centenary. The celebrations included a dance with a concert. Robert Black sang the original lodge song that celebrated its foundation charter.